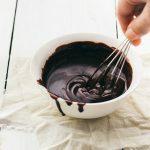 Make 1/2 of this recipe if you want to drizzle the ganache onto the top of a 9-inch or 10-inch round cake or bundt cake. Place chocolate in a medium heat-proof bowl. Set aside. In a small saucepan over medium heat, bring cream just to a boil. Immediately pour cream over chocolate and let sit without stirring for 1-2 minutes. Then, whisk mixture gently until completely melted and smooth. Add alcohol, if using, and whisk to combine. Ganache can be kept in the fridge, covered, for up to a week. Reheat gently (to avoid burning) in the microwave.